Let's study the meaning of a couple of words, shall we? First of all ... hypocrisy. The dictionary defines it as "the practice of claiming to have moral standards or beliefs to which one's own behavior does not conform; pretense". Now, let's look at the word spa. It is defined as "a mineral spring considered to have health-giving properties", or "a commercial establishment offering health and beauty treatments". 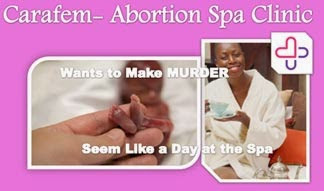 So, I think you will understand why I titled this post as I did when I reveal that a new chemical abortion clinic, calling itself a “posh spa,” launched a daring advertising campaign in the District of Columbia this week. With brazen billboards that sport headlines such as, “Abortion, yeah we do that,” it is obvious that they wish to portray abortion as a common and trendy practice. Not only does this organized campaign offend me -- it disgusts me! The focus of an abortion clinic is the death of a living fetus; there is nothing healthy, or life-sustaining, or beautiful about it. Women do not go there to receive treatment to enhance themselves, or improve the quality or appearance of their physical bodies. They go there for exactly the opposite reason -- to remove a vital and living part of themselves; an unborn person that relies on them to protect and nurture their life. And to assert that abortion is popular, stigma-free, and no more problematic than any other procedure is not only misleading, but morally repugnant. It doesn't change my opinion when informed that clients are welcomed with hot tea and comfy robes in the clinic, which features wood floors, plush upholstery and natural wood tones, so it resembles a high-end salon or spa. Nor can this clinic sell me on their approach of creating a "brand" of abortion clinic that is “fresh, modern, clean, and caring." They can call it the Ritz-Carlton for all I care. They are not selling wellness; they are selling death! But it shouldn't surprise us that the abortion issue is adopting the method of other unbiblical positions. In an effort to de-stigmatize the procedure, this "Spa" approach is attracting a passionate new crop of young activists to the movement. Women are going door-to-door in conservative neighborhoods to talk about their abortion experiences in the hope of changing minds. New online projects even solicit personal testimonials, including from women who have no regrets about terminating their pregnancies. Telling personal stories echoes a strategy successfully employed by the gay rights movement, helping it change public opinion by coaxing people to come out of the closet to their friends, neighbors and colleagues. But what Ms. Pollitt doesn't understand is that there is a Higher Authority over that unborn child than her own. The Creator God of the Universe -- who created her, as well as her child -- has a legal entitlement to demand that we respect what He has created. And He has made His opinion well-known. In Leviticus 20:2-5, He states, “Say to the Israelites: 'Any Israelite or any foreigner residing in Israel who sacrifices any of his children to Molek is to be put to death.' " Got it? It is an act that the God who created you, has declared is worthy of death. How many women in this country alone, have fallen on their knees and repented of this decision? And just because this luxurious, posh abortion clinic only administers pharmaceutical abortions, does not lessen their responsibilities towards those unborn fetuses. And I do not buy their argument that if I oppose abortion, "it’s not going to affect [me] if a clinic wraps its patients in cotton robes instead of paper ones.". Excuse me, but it does affect me, because the Bible says God causes the rain to fall on both the just and the unjust (Matthew 5:45). So all of us in this nation are exposed to suffer the penalty of God's punishment for the nearly 56,000,000 aborted babies since 1973. This latest attempt to "soften" the image of abortion clinics does nothing to appease the followers of Christ who honor all life. No amount of persuasion or false facade can transform this offense against our Maker. May God have mercy on the innocents who have been slain in this rebellious generation. Thanks to articles in The Washington Post and Breitbart.com for the details on this clinic. And to see a 30-second advertising spot on their efforts to de-stigmatize abortion, click here. Isaiah 44:2 "Thus says the Lord, Who made you and formed you from the womb...."
This just absolutely disgusts me. The sins of this world on heavy upon all, especially the children.